Picasso paints a picture of “A poor beggar with a boy” in 1903, this period of his work is called “blue”. Pictures of the master of these years attract the attention of blue and rich blue colors. For Picasso, these are the colors of sadness and sadness, spiritual melancholy and longing. The artist is excited about the problems of loneliness, physical injuries and poverty, conveying excitement and viewers of the paintings. Frequent characters of the paintings of the “blue” period – beggars, squalid, vagrants, prostitutes and alcoholics. People in the pictures have a detached look, they have lost track of time and harmony, both with others and with themselves. The immersion in the blue of Picasso was caused by the suicide of his close friend. 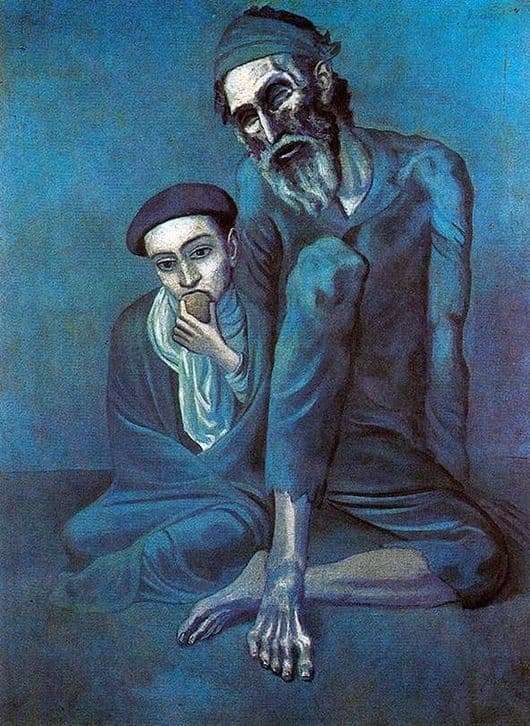 “An old beggar with a boy” is an early picture of the master, in which it is clear that he has not yet reached corona cubism. The main visual tool here is the line and monochrome. The old man and the boy are written clearly, truthfully, without embellishment. The picture is full of poetry, lyrics and harmony. The prototypes of the characters depicted on the canvas, Picasso could easily watch in Barcelona, ​​where he lived at the time. That is why the old man and the boy are so true. With clear lines, the master draws and shows the viewer the exhaustion of people, the limit of their strength, they are hungry, skinny and almost incorporeal. This makes the characters Picasso inspired. The figures are static, but with lines the artist shows their anxiety, the inner work of thought. The boy is sad and thinks about something, eating the last meal. The old man looks ahead with a sad look, he is mysterious and seems majestic like a statue. The painting “Beggar Old Man with a Boy” is recognized by the “blue” color spectrum in this period. The figures of people and the background are written in deep blue. On the blue wall of the background, the figures of beggars stand out clearly thanks to the dark lines.